Following the launch of the Tesla Model Y, Tesla’s CEO, Elon Musk, has once again revealed plans of entering India sometime in 2019-20. 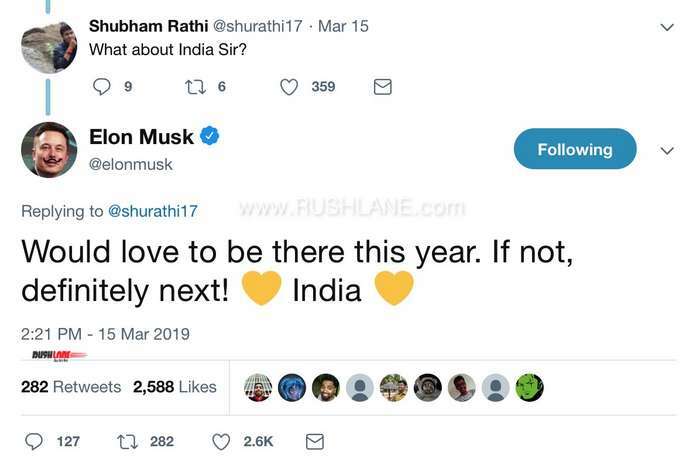 This is not the first time that Musk has shown interest in India. Around 10 months ago, he had also spoken of launch in India. In 2015, PM Narendra Modi had visited the Tesla headquarters in Palo Alto, California and was given a grand tour of the plant by the CEO himself. Earlier, the company’s former CIO, Jayaprakash Vijayan had also visited the Indian Capital, New Delhi with plans to set up a distribution network. Though the country’s high taxation policy along with high import costs brought in no further results. In June 2017, Anand Mahindra had also invited Tesla to set up base in India and all these endeavours could soon see some positive effects later this year. Tesla has recently posted profits to the tune of $311.5 million. He had at that time revealed that they are citing a partial presence not only in India, but also in Africa and South America by the end of this year; with full expansion in 2020. The Indian Government is also pushing for Tesla to set up a plant in the country which would allow the company to price its products affordably. Prior to official entry into India, with Tesla shutting its stores in favour of online retail, the company’s product lineup could be made available in India soon. 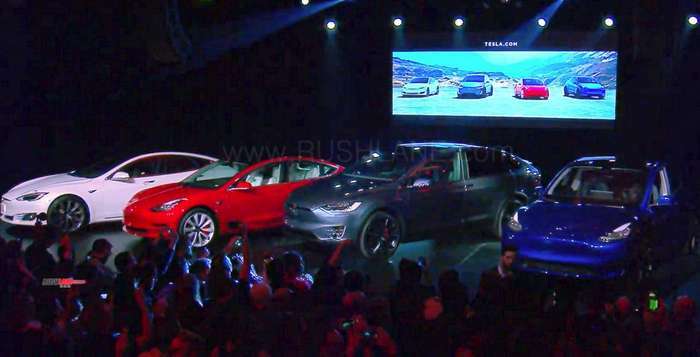 Just a few days back, Tesla completed their S3XY line-up, with the launch of the Model Y. It is an SUV, which sits above the Model 3 in the company line-up. Sales will commence in US markets by end of 2020 while it could also be introduced in India sometime in the future along with the Model 3, which is potentially the first official model that Tesla might launch in India. The Model 3 is priced at $35,000 (Rs 25 lakh) in the US and is perfect for an emerging EV market like India. The standard Model 3 offers a certified range of 350 kms on a single charge and is a right wheel drive variant. Acceleration from 0 to 100 kmph is possible in 5.6 seconds for standard variant. Performance AWD variant offers acceleration from 0 to 100 kmph in 3.2 seconds. The launch of Tesla models in India will be a part of the Government of India FAME II scheme for which an amount of Rs.10,000 crores has been earmarked with an aim to incentivize purchase of electric vehicles. But only made in India EVs will get the subsidy. If the Model 3 is imported into India, it could be priced around Rs.50 lakhs, as per existing import duty structure and hence the Indian Government is pushing Tesla to set up a production plant in the country so as to keep prices at affordable levels.